Versions of the fairy tale, Cinderella, exist in most cultures around the world. In the U.S., there have been cartoons, musicals, ballets and films. Yet, Matthew Bourne’s magical reimagining of “Cinderella” as a tale set in Blitz-era London, which opened at the Ahmanson Theatre in Los Angeles this week, plumbs new depths in its entertaining presentation. “Cinderella” as presented by Bourne and his New Adventures Company is a highly creative dance production with charming theatricality and technical finesse. Bourne is one of the most successful choreographers and artistic directors in the United Kingdom. He use the traditional Prokofiev “Cinderella” score, which was written during World War II. The darker, quirkier tones in the music add to the drama presented of London life during the Blitz with airplane noises overhead, air raid sirens, bombs failing and terror, as well as the wonder of the ingénue at the ball. The opening night Cinderella, Ashley Shaw (the lead roles are shared), is winsome yet funny around her stepfamily. She became vivacious and stunning when magically transformed. Cinderella lives with her invalid father (Alan Vincent), alcoholic and cartoonish stepmother (Madelaine Brennan), stepsisters (Anjali Mehra and Sophia Hurdley), and in a twist stepbrothers. There is a self-absorbed gay one (Jackson Fisch), a creepy older one (Dan Wright) and a misbehaving younger one (Stephen Murray). Needless to day, they provoke Cinderella and taunt her, particularly when they receive coveted invites to a ball at the legendary Café de Paris, a real London nightclub during the period. Cinderella actually meets her “prince” before the ball. This prince is a wounded Royal Air Force pilot named Harry (Andrew Monaghan). Harry stumbles into her home after presumably crashing and getting injured. The Angel (Liam Mower), this production’s version of a Fairy Godmother, magically transforms the drably dressed, dark haired Cinderella into a blonde stunner. In Bourne’s creation, she awes the crowd and woos her prince at the Café de Paris. She and the debonair Harry lock eyes and dance divinely. The wartime setting and realities emphasize the need to make quick connections and live in the moment. Then, the planes arrive and drop bombs on the venue, which was actually bombed during March 1941, killing or injuring its occupants. Later, Cinderella flees the wreckage at midnight, naturally leaving behind a shoe (some things have to stay the same!). The dancing and pantomiming throughout the show is imaginative, beautifully performed and, at times, amusing. Some of the choreography is balletic and some ballroom. Other moments present dances from the period, such as the Lindy Hop. The execution throughout is flawless. The production does seem to lose steam toward the end. The audience cannot help but wonder when Harry is going to find the shoe’s owner. Later, the duo takes forever before finally setting off for happily ever after. Yet, overall, Bourne’s “Cinderella” offers a thoughtful, adult version of the fairy tale sure to please dance lovers. Like Matthew Bourne’s “The Red Shoes,” which played the Ahmanson in 2017, his WWII-era reimagining of “Cinderella” offers an updated version of a classic story with magical staging and a stellar cast. Presented by Center Theatre Group, performances of “Cinderella” will continue at the Ahmanson through March 10, 2019. 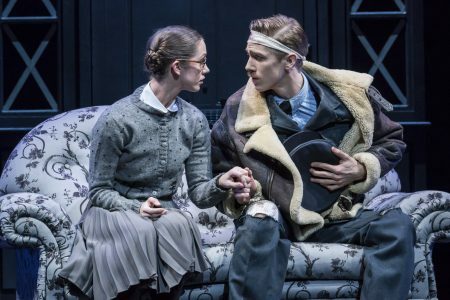 Photos by Johan Persson of Ashley Shaw and Andrew Monaghan in Matthew Bourne’s “Cinderella,” courtesy Center Theatre Group. 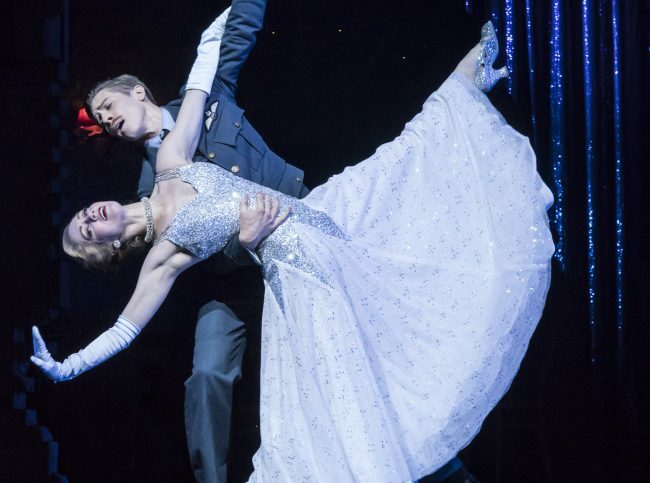 5 Responses to "Matthew Bourne’s WWII ‘Cinderella’ Magical Reimagining"
Very good blog! Do you have any tips for aspiring writers? I’m hoping to start my own site soon but I’m a little lost on everything. Would you recommend starting with a free platform like WordPress or go for a paid option? There are so many options out there that I’m totally overwhelmed .. Any suggestions? Thanks! I don’t even know how I ended up right here, but I thought this put up was once good. I do not know who you are however certainly you are going to a well-known blogger in the event you are not already 😉 Cheers!